"Molly, my Giant Maso Mastiff is 75% Old English and 25% Cane Corso. I took this picture and the reason I chose it is because this is what she does all day long (lies around). She has a very gentle and easy-going temperament. She loves people and all animals. At the time of the picture, she was 15 months old and weighed approximately 100 pounds. At 25 months old, she weighed 147 pounds. Molly loves attention. She loves to cuddle (but she thinks she is a lap dog) and she tries to lie right on you. As you can imagine, she is very heavy—only her head really fits on the lap. Since she cannot actually fit on anyone’s lap, she lies down on their legs and feet instead. Molly does not like to be sprayed by the water hose. She also does not like to be weighed; it is very difficult to get her on the scale. Molly is a very happy dog. Her tail is always wagging. She is especially good with elderly people and small children. She very rarely barks or growls, but if she does, then she is not happy about someone or something." Giant Maso Mastiffs look like very shiny coated Old English Mastiffs that come in a wider variety of colors, including fawns, grays, gray brindle, solid black, brindles, reverse brindles and apricot. Giant Maso Mastiffs are said to have the great size, lovable, gentle disposition of the Old English Mastiff, with better maternal instincts, higher intelligence, along with more muscle and the protective instincts of the Cane Corso. It is a self-confident, watchful, and patient dog that is gentle-natured towards his family. Intelligent and dignified. It rarely barks, but it is in its nature to defend its territory and family. Calm, steady and docile. Good natured, but very large and heavy. Responds well to calm, but firm, patient training. This breed loves to please and needs lots of companionship. Lives to please its owners. Usually gets along well with other dogs. Guard dog protection training is unnecessary for this naturally protective breed. Loves his family and does not care to be home alone all day long. Fairly easy to train. It loves children. Masos have little to no drooling. The objective in training this dog is to achieve pack leader status. It is a natural instinct for a dog to have an order in its pack. When we humans live with dogs, we become their pack. The entire pack cooperates under a single leader. Lines are clearly defined. You and all other humans MUST be higher up in the order than the dog. That is the only way your relationship can be a success. The Maso Mastiff will do okay in an apartment if it is sufficiently exercised. They are relatively inactive indoors and a small yard will do. Mastiffs are inclined to be lazy but will keep fitter and happier if given regular exercise. Like all dogs, this Mastiff should be taken on daily regular walks to help release its mental and physical energy. It's in a dog’s nature to walk. They should always be leashed in public. The Giant Maso is a new developing breed, not a hybrid dog. Masos were started around 2001 and still has several years before they are complete. The lines consisted of Old English Mastiff and Cane Corso Italiano. 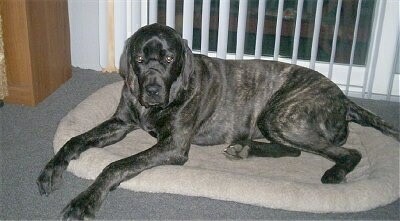 The founder does state they are not a 50% to 50% hybrid; it is 75% - 85% Old English Mastiff. The goal is to create a mastiff that will be healthier, more athletic and live a longer life. 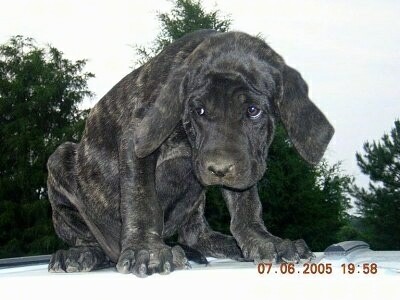 "Molly the Maso Mastiff puppy at almost 4 months old and weighing 44 lbs." Molly the Maso Mastiff full grown at 140 pounds—"Molly loves to go for walks. She does not require a lot of exercise, though she gets tired! She will not go off our street. She is very protective of her neighborhood and is very territorial, so she needs to be close to home (at least I don’t have to worry about her running away!). She loves to play with all her doggie friends in the neighborhood. She is quite popular with all the dogs and people on the street. She loves to go for rides in the car! She does not drool too much, just after she eats or drinks something. She is very easy to groom because her hair is very short. I should describe her: She is very tall (when standing on her hind legs, she reaches 6 feet), long and lean. She has great muscle tone and her coat is brindle—very soft and shiny! My nephew and niece-in-law also have a Giant Maso Mastiff (she is Molly’s sister) and she is just as wonderful as Molly is. They look nothing alike, however. Casey (Molly’s sister) is fawn-colored and she is built stockier and shorter than Molly is. She has the same gentle and loving temperament as Molly does. "As big as Molly is, she does not take up a lot of room. She likes to curl up in her bed. This breed really does not require a lot of space inside. Molly gets walked every night and during the day goes out in to the yard and runs around for a bit and then comes back in and takes a nap. She is home all day with my 81-year-old parents and she never gets in their way! Her eating habits are not what one would expect for such a big dog (this is also true for her sister Casey). Molly gets fed once a day and it lasts her the whole day! "Molly and Casey both get along very well with other dogs and they have from the beginning. Molly loves to play with all dogs, regardless of their size. She’s just so fun-loving and just wants to play. As far as training goes, they definitely are very intelligent dogs and training them is easy. The only slight problem I had was because we went to PetSmart and they train right in the middle of the store. Molly has always attracted a lot of attention, so it was hard for both of us to concentrate on the trainer because people were constantly stopping and petting Molly and asking me questions about her! But, she is so well behaved by nature that she took very well to the commands we were taught! And again, these dogs really do love to please! As far as meeting strangers goes, she is more leery of men. But, she will sit there and allow them to pet her; if she is not comfortable, she will just walk away. She has no aggression in her. She takes very well to strange women, though. Even though Molly is a really big dog, she can still be startled easily. Women have a tendency to walk up to Molly slowly and speak calmly, whereas the men can be kind of loud and obnoxious (she does not like this). As far as strange children goes, no problem at all. She absolutely loves all children, i.e. babies, toddlers, teenagers (especially babies). She will sit or lie down right next to a baby carriage to allow the child to get used to her. If a small child cries, she goes over and licks them. Children can hang all over her and it does not faze her in the least. She is very patient and easy-going. I believe these dogs have a natural maternal instinct in them that is very strong. They are definitely very close to their families. They don’t like to be left alone. They are not the type that if you leave them home alone they will destroy the place, but they do get sad if you leave them. But, what a greeting you will get when you get home!!! When Molly is left alone, she just sleeps. "Personality wise, Molly and Casey are very similar. Molly tends to be a bit more outgoing, I think. She’s more playful. They are both “gentle giants” though and are very affectionate and protective of their loved ones. Neither one of them really barks or growls." Dominic the Giant Maso Mastiff at 7 years old— "Dominic is a beautiful, loving, spoiled male Mastiff. He's 7 years old, still thinks he's a puppy, and loves attention. Loves going out with the family, has a huge personality, you would think he was human."